The Lammas self build project at Tir y Gafel, Glandwr, Pembrokeshire, is Wales’ first collective initiative based on what is now the (TAN)6 national planning guidance for sustainable rural communities. 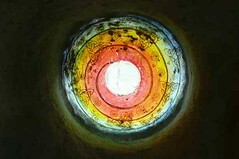 (One Planet Development). 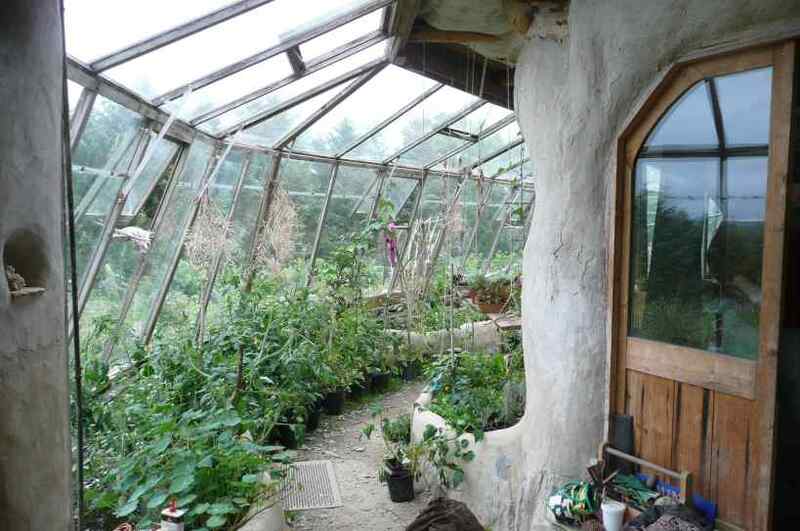 Formed within a wider co-operative support network, and with the aim of encouraging this type of living elsewhere, the principles of PermaculturePermaculture is the practice of a sustainable way of living in all its forms. 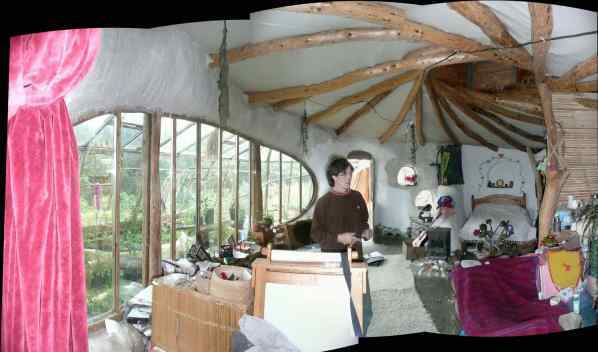 In the UK the coordinating body is the Permaculture Association are central to the development. 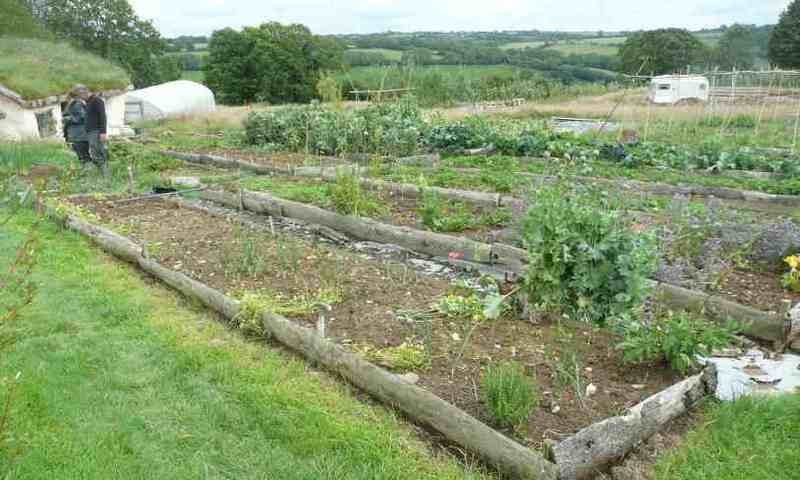 It is still early days (July 11) and the residents have been busy mainly with establishing the permaculture gardens, orchards, woodland, polytunnels etc. 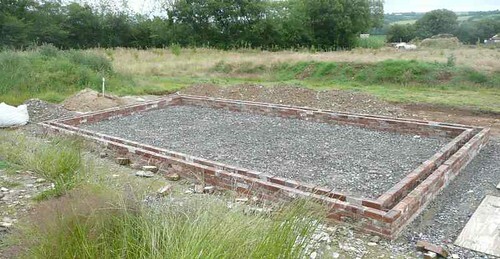 and building barns to keep tools and produce, so there is not much to see yet in the way of houses. 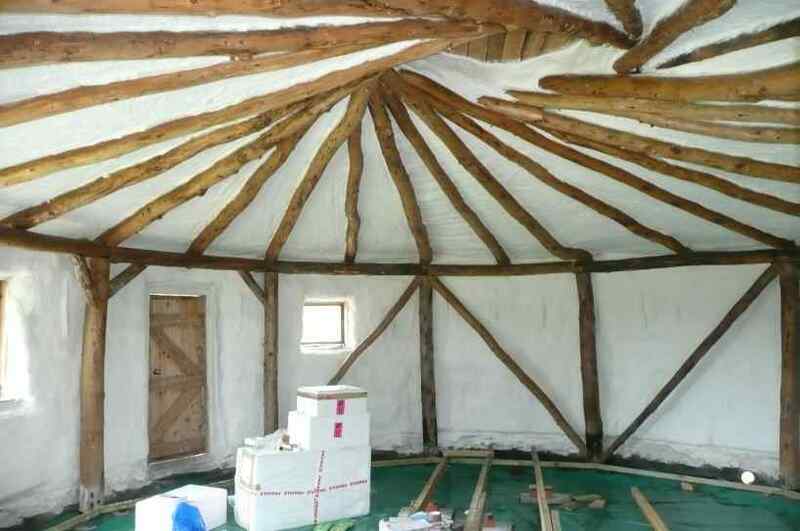 However the construction methods so far have been mainly based on roundwood timber frames with lime rendered straw bale infill. Mostly turf roofs. Andy and Jane, with help from volunteers are just completing their barn. Their target was to source all their materials for it within a five mile radius and this they have pretty much achieved. As straw was not available close by at the time, they went for hay bales instead. (Andy says hay bales are considerably more difficult to work with than straw). Their food production is going well. This is a small part of it. 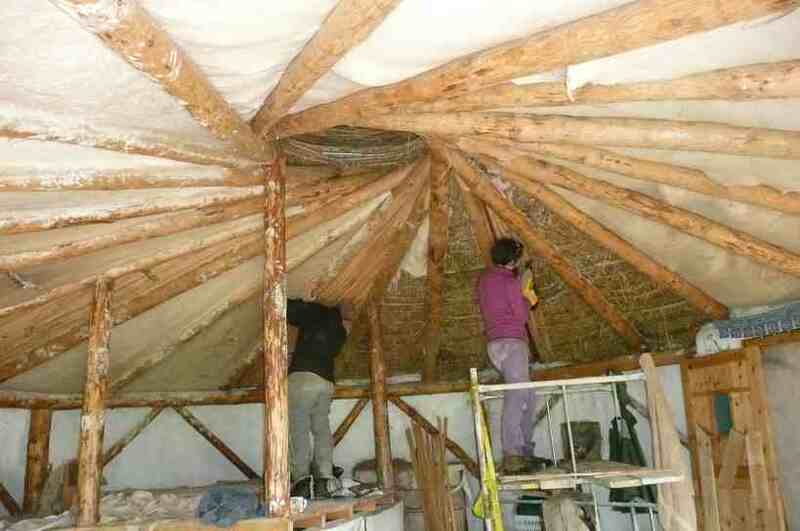 Lime plastering. Outside, the roof is turf. Catherine and Leander have nearly finished their barn. The dark green membrane below the floor is to prevent radon gas (natural to the area) from entering the building. They are the family who have made the most use of mechanised equipment. They are not averse to using a digger when the need arises. Otherwise people are using mainly hand tools. The whole development will potentially have access to a considerable source of renewable energy eventually. There is an existing but out-of-use hydro electric generating setup running off a river nearby and it may be capable of nearly 30kW of output when the turbine and generator are restored. Still, you get the sense, talking to people, that there is a reluctance to go down the road of relying on large amounts of generated energy. Jasmine and Simon have also built a roof with a reciprocating truss and this building also benefits from a long conservatory used for growing food. 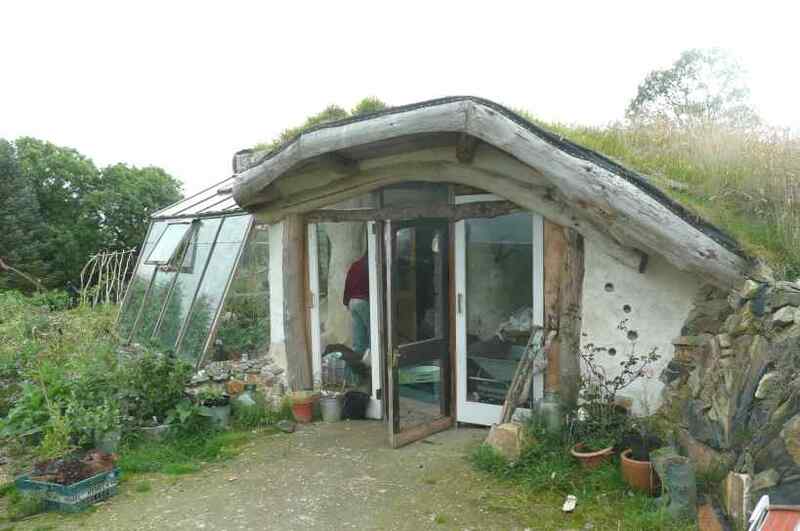 Jude is a relative newcomer to Lammas and here is her poly tunnel frame ready for skinning. Central to the whole development is the communal building known as The Hub. 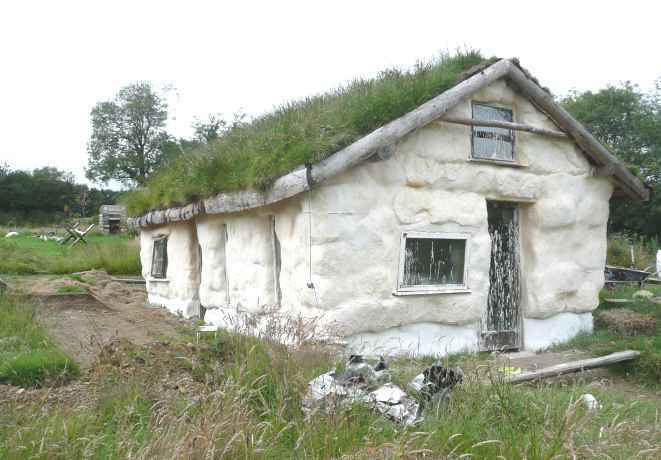 This was built with the help of a DECCthe government Department of Energy and Climate Change Award and is nearing completion. See also the Lammas web site. not years of training to get the technique right. 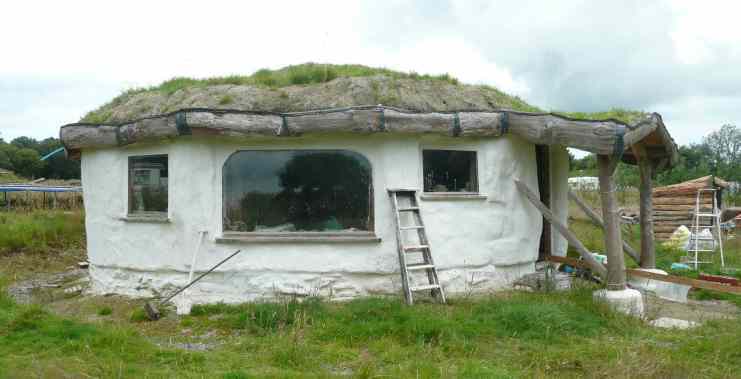 How do you get an architect to build you a replica of the Solcer eco house at Brigend? Do you think maybe the council has the plans from when it gave planning permission? Should I approach Prof Jones at Cardiff Uni directly? They did it to prove it can be done using existing products readily available on the market for the same cost as most new builds. They had SIPS = structural insulated panels, a 6.7kw battery, glazed roof made of pv panels, grid tied as well to sell off any surplus not used, A+ rated appliances, underfloor electric heating, mechanical heat recovery system, direct air heating under the glass roof, insulated and air tight. It was launched with a press day last week. One day all homes will be like this. I have just watched ‘The House that 100k Built’ on Australian TV with Andy & Jane’s project. Can someone give me an update on how they are going with their home? http://www.youtube.com/watch?v=CNtCOrMwwH0 is a good video that shows the way the beams go together. The roof is covered with a cotton lining then insulation and then a plastic liner before turf goes on. d. How do you make a straw roof waterproof? Greatly appreciate a relpy, please. i have looked at the project and am very interested in joining the coop if possible. im a horticulturalist with a background in shortlife housing cooops in brighton also i was raised in pembrokeshire and am keen to return. are all the plots taken? how do i go about obtaining a plot for myself and my girlfriend?